Hi Everyone! I hope the winter has been going well for each of you. I’ve been busy busy! Eve of the Exceptionals (YA Epic Fantasy) was released January 22nd and did amazingly with pre-sales and is continuing to generate a buzz and has been receiving some awesome reviews. After only a short break once Eve was released, I have started work on Only: The Alex Conner Chronicles Book Three. I am at the halfway point, and it is slated to come out in June 2017. On top of that, I have been asked to write a short dark fantasy story for an anthology titled: The Aching Darkness ~ A Dark Fantasy Anthology. Four other authors will be joining me, and this powerhouse project will release in June as well. 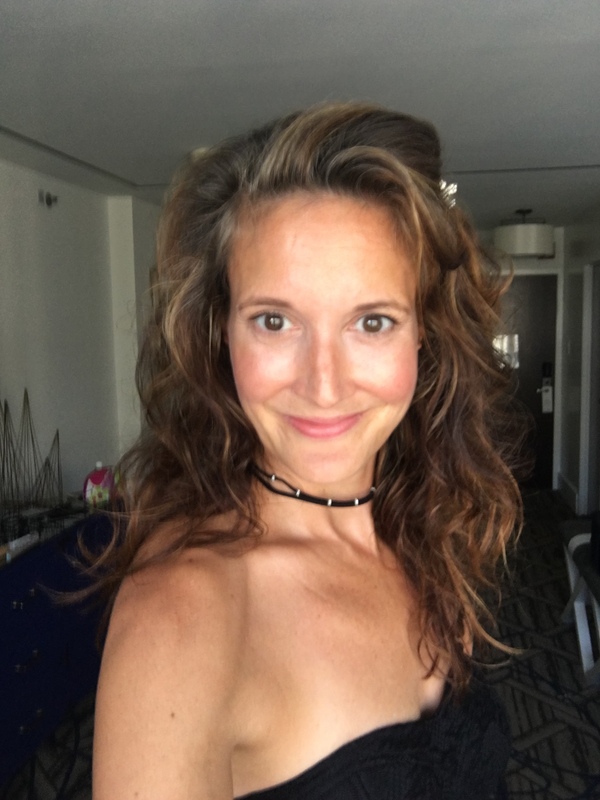 I will highlight one of the amazing authors joining me in each newsletter, so check out this month’s author, Alexia Purdy, below. My upcoming children’s picture book, Jake the Growling Dog, is in illustration and will be out July 2017. I am excited to have local artist Kerrie Joyce creating Jake’s world (check out the incredible cover for Eve of the Exceptionals that she created). This fun & fuzzy book focuses on accepting others differences and includes a loving kindness activity for families, schools, and counselors. I’ve also been booked at many local schools to do readings and talk about my path to becoming an author. I love connecting with students, and I will definitely be writing more YA and children’s books in the future. I’m so excited about my releases this year and the fun events I’ll be attending. My current calendar is below, but there are many more to come! As always, please feel free to contact me at any time to talk about my books, the writing process, to request signed copies, or for speaking engagements. All of my links are below, and I have also added my presentation booking form as well. Spring is coming, so get ready for some warmer weather, and some fun reads! Introducing Alexia Purdy: Alexia is a USA Today Bestselling author who currently lives in Las Vegas and loves spending every free moment writing or hanging out with her four rambunctious kids. Writing is the ultimate getaway for her since she’s always lost in her head. She is best known for her award-winning Reign of Blood series, and A Dark Faerie Tale Series. Now only .99 on Amazon!! Hello family, friends, and fans!! This is an exciting day. 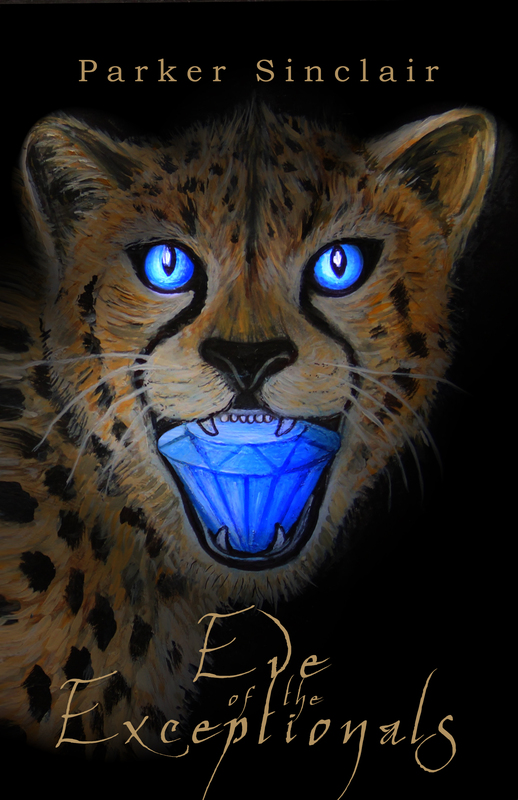 I have just revealed the amazing cover by artist Kerrie Joyce for my new YA Epic Fantasy novel, “Eve of the Exceptionals”. Don’t miss this spell-binding journey full of magical beings, epic adventure, and two young hearts destined to save a kingdom. You can pre-order your copy today on Amazon in both Kindle and Paperback format (see links below). The official release date is January 20th, 2017 & the official book release party will be February 3rd, 2017 in Virginia Beach at Tapped Gastro Pub in Redmill. I’m overjoyed with this book and have loved reading it to my daughter, age 7, and to my friends of all ages. I know this will truly be a magical book for everyone. Thank you everyone for you support on this journey and I hope you enjoy reading my newest book. Reviews are always welcome as they help me in my rankings on Amazon and Goodreads. Whether you’ve read my Alex Conner Chronicles series or will be reading “Eve of the Exceptionals”, I would truly appreciate even the shortest of reviews or rating. Speaking of Alex, her next book, and official third book in the series, will be out spring 2017. If you’ve already ready book one and two, check out the Novella for Sandra called “Forbidden” it will lead into Book three and is a wicked fun ride! I wish each and every one of you a wonderful holiday season. Pre-order links are below as well as my events for 2017 (more to be added) and my social media information. Being a mother of two young children, an independent author, and a full-time high school counselor, I struggle to balance my time. I always want to spend quality time with my family, helping the students on my large caseload, and chasing my dream. Oh, and there’s taking care of myself by getting sleep, exercising, and eating well. Is there ever enough time in our day? Does anyone ever get enough sleep? I hear “how do you do it?” many times a week and sometimes I have a hard time answering that question. To be honest, I am not always sure of how I do it. Especially when my 3-year-old bangs on my computer, the clock reads 12:30 am and I have to get up in less than 5 hours, or when I have blood shot eyes, a crick in my neck, and I still have to take a shower and make lunches. Not to mention the time I haven’t been able to spend promoting and marketing the book the way I really want and need to. I should be hitting the streets and passing out cards. I am supposed to be dropping into bookstores and calling reporters but I’m instead rushing home to get my oldest off the bus after a full day of work, getting in a quick run so that I can continue to stay mentally and physically healthy and strong, and all the other life responsibilities that I know we all have. So, like I tell my students, I have set goals, and I have to get creative. I know what I am capable of now, and I am willing to keep working hard by putting out quality books. Trips are essential to market, and I will dedicate at least two times out of the year to travel and market. It is important to be inventive when trying to keep yourself healthy and some things I am really good at doing, and others, well those I stink at. So here are the ways I have tried to make it all work. Some days I feel like I am owning it, and others, well don’t judge when I am spazzing and close to tears. Exercise: Gone are the days I spend an hour or even more in the gym or at classes. I run or do a quick 15-20-minute workout on my non-running days. 8fit is an awesome app that I have been using for the past two months, and they have high intensity and diverse workouts, fitness coach and meal ideas. Plus, my girls love to try to do the exercises with me or at least enjoy pushing the “next” button. A small caution for all of you with small, expert device wielding or button pushing little ones. They have skipped my rest many a times, and boy does that make the workout much harder ☺ On my run days, I try to take them with me when I can. My oldest can ride her bike with me on over 3-mile runs while the little one still loves the jogging stroller. I feel I am still getting quality time with them and taking care of my body and mind. Sleep: Yes, even with my second child who trained me to survive on little sleep, I still need it. We all do! Some of my compromises with her, now 3 and still hard to get to sleep and keep asleep self, are that I will stay in her room, but I will work on my computer as I sing her to sleep and be there when she wakes- up afraid. Yes, I fall asleep in there and wake confused about where I am, but hey it’s sleep! She has also become ninja-like for those times I make it to my bed, and I find her cuddled up with me at 5 am. No, I don’t think it’s the best sleep for either of us. I mean who sleeps well with little feet or a tiny toosh in their face at all hours, but we are doing the best we can and for now- and that’s okay. Eat: This part I admit I am not the best at and typically consult my older, and MD wielding, sister. She does a fantastic job at planning meals for the week while my family does not. I do, however, have two little helpers now, and I have been putting them to work on smaller, and safer tasks. Ones such as making/packing lunches (beware of the double dosing on the sweeter treats. Mine are sneaky sometimes), mixing ingredients, making a salad, and my oldest can even make scrambled eggs. I also make a ton of hard boiled eggs, chops veggies for the week and divvy them up for lunches, and ask for help more when I need it. I was the one always going to the store and started to get annoyed with my husband, but then all I had to do was ask. Now he goes a lot after work or in the morning after dropping off the girls. Communication is key, and although we are all super mothers, fathers, girl, and boyfriends, or single moms and dads, we need to ask for help sometimes. Leave it! : Sometimes the best way to take care of yourself is to NOT work on your project at all. That’s right, close or don’t even pick up that laptop, notebook, or palette. Push the stress aside for a day, days, or even a week as long as you can still meet your goal or deadline. Sometimes the break unlocks a floodgate, and your creativity will come rushing out tenfold; more so than if you forced it out piece by piece instead of taking a much-needed break. This is incredibly useful for writers block, but more importantly for those of us that have a ton of other hats and need to prioritize or just rest. As long as you keep your focus while you take a break, never fully letting your dream escape the track you out it on, I’m sure you will see amazing results. All in all, if you don’t take care of yourself you won’t be happy, those around you won’t be happy, and it will make it harder actually to reach your goal. Reaching your goal beaten down can lead to never wanting to repeat what you have worked so hard for, and if it’s a writing career you are aiming for –cranking multiple works is key! 2. How do you find time to write? Into the night: Being a night owl helps, well it helps my writing but not the dark circles the next day. It also helps that I have a goal, four books in 4 years that I will keep cranking out and market the best I can. If I hit wall after wall and don’t find my niche to keep going, then I will reevaluate. No, I won’t quit, but I may need to realign my goals, and I also may not be able to keep up the pace and the late nights. I did invest in a laptop with a backlighted keyboard as well to be able to type quietly in bed next to my little one. For those of you who are early risers and don’t have to be at work at 7 am like I do, you can reverse this and sneak your writing in early. During the kids’ activities: Thankfully my girls like at least one thing in common so I looked around for class times that were the same or close to each other at the same facility. My laptop goes with me, and I sit and type while they enjoy their class once a week. I bring my ear buds so I can focus and get a good hour in. The girls do well when I am there now, whereas before I was in the car that was not the most comfortable of experiences. There aren’t any coffee shops, libraries, etc. close enough, but you all may have one nearby that you can pop into during their class as well so be on the lookout. Mommy isn’t here: When the kids know I am home it is “mommy, mommy, mommy!! !” So, yes sometimes I have to pretend I am not home, and my husband takes care of things when I am really trying to get something done. These don’t have to be major chunks of time when you can focus, so an hour or so is usually enough. This act of hiding myself away is also a good plan during your lunch break. You can eat and write a little for yourself on your break! 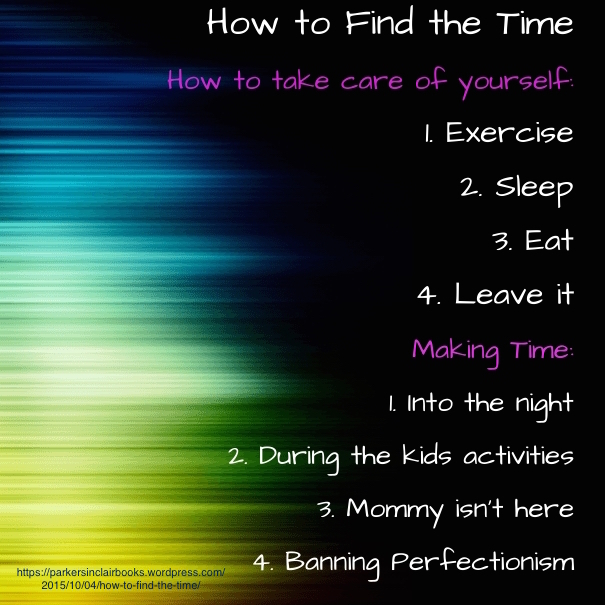 Banning Perfectionism: So, I’ve been telling you over and over again to use those little chunks of hours, and some of you may be thinking I am crazy. I know it can be very difficult for some of us to just write, to get it all down, no hold’s barred, balls out, and without fear. My husband, in fact, struggles to let an email for work flow without having all the right words and those perfectly worded sentences and structure. There are times I have felt the same. I pull out my hair out and chew on my nails as I searching for a word, a way to lead into a scene, or one of the hardest things-closing a chapter or ending a book. Now if I can’t find a word I write a simple one, highlight, and come back. If I can’t lead into a new scene seamlessly, I write a note to myself in that spot, highlight it, and move on to the next scene. It will come later, I promise. Free writing is essential to get your thoughts out, to move through the ideas of your story, email, speech-whatever it may be. So, try to remind your anxious mind that you will go back and fix all those crummy overused words, those commas in the wrong place, or that ending and just write!! I hope the tips I have learned throughout my process of writing my first two books are helpful for those of you chasing down your dream. For some of you, it may be to become a writer as well, or an artist, maybe you are a student in college or working on a report, article or dissertation. Whatever the case, I hope I have helped you find the time. 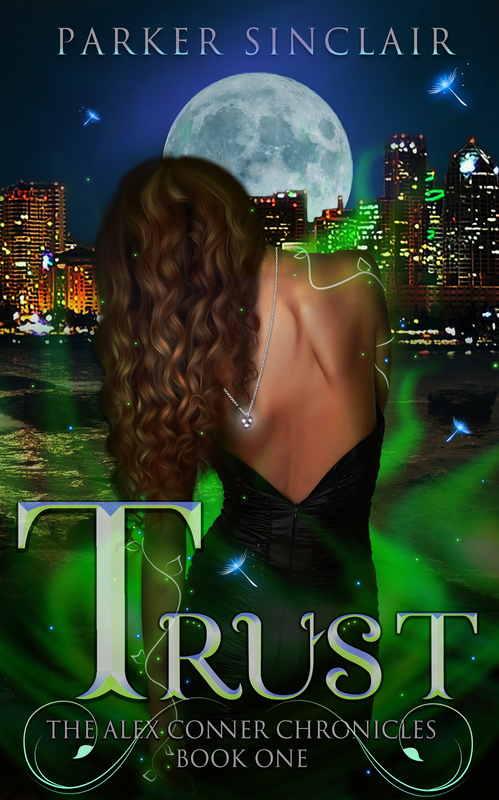 Author of Trust: The Alex Conner Chronicles Book One, an adult, urban fantasy. As I have gone through grief, and now watch, listen and feel others go through it as well, I have been thinking about how I would help them professionally. What is the best way to let a parent, friend, or loved one of someone who has lost someone close to them know about some of the therapeutic ways to find happiness. About the ways to live with the pain. Because there is no complete removal of the pain, in some cases that isn’t even the desire. To fill no pain is to not feel at all, to not miss, to not mourn and then you are not keeping your loved one alive in your heart and mind enough. But what if that pain paralyzes you endlessly? What if you can’t keep it within you? This sadness that is now a part of you, a shaper of who you are. But, you are drowning in your sorrow, forever missing and longing for someone who is no longer there, can no longer physically be there with you…for you. Is it your destiny to cease to be as well? Will you then be another loss to those who have already lost this person, you all love? And how long will you feel what you are feeling? It may be anger, denial, a disconnection with reality. No, there isn’t a timeline for grief, even though I do believe in steps and phases, but there isn’t a set amount of time for each of them. And, not everyone experiences all of them in my opinion. I was stuck in anger for most of the time since my mother has passed…denial was not an option. I was somewhat prepared for her passing, more so than I think a lot of people are given the nature of the medical professionals in my family. No, I don’t necessarily think it should be that or even can be that way by any means, just my experiences, and the way things happened for me. There are different reasons for grief and mourning…sometimes it isn’t a person at all; it may be a pet, or a place you have loved and cherished. My grandfather lost his home in Katrina and all of the memories of my grandmother along with it- washed away into the Back Bay as his refrigerator floated in the ruined garage. All of the pictures, clothes, knick-knacks, jewelry, memories…gone, and there was grief and despair along with that loss. We all felt that for him and through him. The loss of memories and of a home that we all shared during holidays and visits. Pieces of my grandmother that were still able to keep her close washed away with the raging waters that racked the gulf that year. I had thought this would break us all, but my grandfather moved through his grief, wave and after wave wracked this quick as a whip pilot, doctor, and psychiatrist. Father of four, grandfather of three…militarily strict but funny as hell. Oh, how I miss him every day as well. My thoughts on grief are more of my thoughts on a happy life. It all relates when you lose sight of your happiness. When you lose your course, your strand of the web you were on with such sure footing and then blown off. Then you have to try and find some happiness and rational for moving forward. To shed the anger, the jadedness, the loss of faith and find a way to continue in their spirit, in their memories, yet without them. I don’t claim to heal intense levels of depression with these suggestions. In those cases, it is imperative to seek professional help, and if you know someone you think is depressed or suicidal, don’t fear asking them right out about their safety. You won’t inadvertently put that idea in their head, but by asking you may just save their life. There are four things I believe can lead to happiness, spiritual growth and a path to healing. Journaling: Finding the time and a way to get the racing thoughts out of your head on onto paper, a computer screen, a napkin, what have you is very therapeutic. It doesn’t matter if those words ever see daylight again. Sometimes it can be cathartic to read it or even destroy what you have written, sending it back into the universe (safely for goodness sakes, no living room bonfires please!). Journaling is also a wonderful technique for anger when you put down what you wish you could say to someone and then safely destroy it, thus ridding yourself of what is eating away at you. Journaling can often help recall forgotten and beautiful memories about your loved one. It can allow you to be raw and unfiltered (make sure you keep it private if that is your wish), and can also lead to incredible levels of creativity and wonder. Empathy: Putting yourself in someone else’s shoes is incredibly medicinal. It allows us to step away from your worries and concerns for a while, which our souls need a break from, and feel compassion for someone else. Being empathetic can lead to helping a fellow person in need which is also very healing and helpful for everyone involved. Mindfulness: This technique saved me from what I think was a complete paralysis in my anger. I had lost my creativity and the future of my writing, and I just knew I was seconds away from panic attacks. Those seemed inevitable as work became increasingly demanding and stressful for not only me but everyone around me. I read about the technique in a book for mothers that focused on the need for me to be happy in order for my family unit to be happy as well. It isn’t an obvious notion for most of us to think about taking care of ourselves first as the best way to take care of others. Some are whispering “selfishness” in dark corners right now. No, we think doing more and more, pushing and spreading ourselves thinner and thinner so that our loved ones lives are fuller and busier are the answers to their happiness but it isn’t. Our children, husbands, wives, girlfriends, boyfriends, partners, lovers, friends and co-workers won’t be truly happy if we are suffering. Our mental and physical health is of the utmost importance if we are actually to help others around us. Mindfulness allowed me to take a break from everything and focus on only myself. Sometimes I know it is hard to find the time, sometimes I forget I need it, but it is refreshing, mind opening and essential. A free link to the technique is below from UCLA as well as a link to the book I read to get me on that track. Nature: Enjoying the outdoors, the environment around you, tree hugging, dog petting, walking, biking, exploring, traveling, it is all incredibly therapeutic. Taking the time to watch a sunset, to go for a walk in your neighborhood, to count flower petals and practicing colors with your children outdoors is my last but not least recommendation. Most of us may be cooped up inside working all day, not feeling the warmth of the sun or the chill of the rain. Whether you like to paddle board, walk, skate, or even taking a drive with the windows down along a back country road. Taking your time and exploring, it is all therapeutic, and I believe necessary. Our history stems from being one with nature to the give and take, ebb and flow, the web of life. We are all connected, the earth, soil, water, animals, plants, bees, and trees; it’s important commune with it all once in a while. So go pick strawberries, body surf in the ocean or hike along that beaten path. It is cleansing and enlightening. Right now I am in the midst of watching those around me experiencing intense levels of sadness, and I thought this is something I know about. Grief is something I have been trained on, lived through and utilize myself. My main character in the Alex Conner Chronicles overcomes a series of various levels of grief and utilizes many of these suggestions herself. Alex may be damaged, perhaps even broken, but she sought to make her life better despite it all. And if what you are currently doing is not working it is time to make a change, time to try something new. Looking to heal and be happier didn’t change the amazing parts of the person Alex is, and the same goes for me and hopefully for each of you. If you would like to read more about Alex, please visit http://www.ParkerSinclair.net for a 3 chapter sample of her first book Trust and to join my mailing list. Be Well, Be Happy and Be You! When one decides to write you may want to include quotes from you favorite books, lyrics from songs or pictures and artwork. What is quite necessary is to get permission to use such portions of work even if it is only one line or lyric. Towards the end of my book, an important character to my heroine is lost, and I found myself writing about not only her loss but the loss of my mother as well. Specifically about one of the last things I did while she was in hospice. I remember her singing “You are my Sunshine” by Jimmie Davis to me. As I held her hand lying on one side of her, and my older sister on the other, I sang a few lyrics of the song to her. “You are my sunshine, my only sunshine. You make me happy when skies are grey. Four short lyrics, something I could have removed from the book and avoided tracking down the copyright holder, contacting the recording company, asking for the use, explaining why, purchasing the freedom to use it…all of that I could have avoided if only I took those lines out- and I did consider doing just that. In fact it was down to the wire, the book was in formatting and my formatter on hold for me to add or keep the lyrics out. One night my youngest daughter, who was born after my mother’s passing didn’t speak very clearly yet, sang those lines to me as clear and beautiful as day. Her smile so bright and her soul singing along with her. At that moment I knew my mom was a part of her, in her smile, her beautiful voice and her strength and stubbornness. I couldn’t help the tears that came, and the decision solidified at that moment- words now forever within my passages and my words of love, loss and hope…My Mother’s Song, My Daughter’s Song and Alex’s Song.